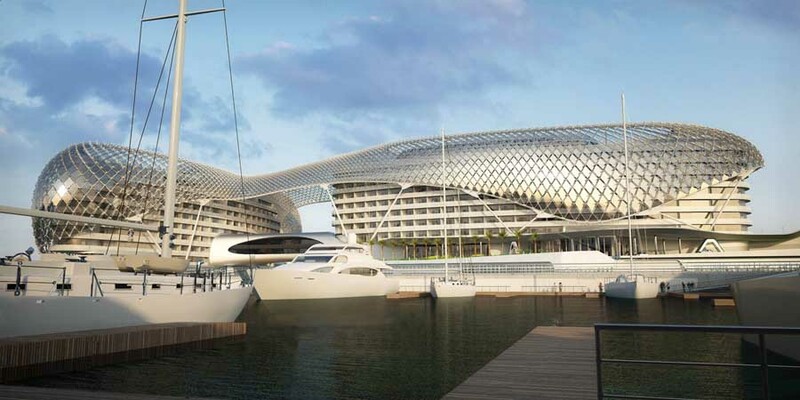 Asymptote’s design of the Yas Island Marina Hotel architecture reconciles the dramatic site conditions with the ambitious program to contain a luxury 500-room hotel with extensive amenities situated above a Formula! Racetrack and within a Yacht Marina. Asymptote’s design enables the merging of an active marina environment with the spectacle and energy of the annual Formula One Grand Prix while also projecting a modern image of Abu Dhabi onto the international stage. The opening of the iconic Yas Hotel, designed by New York City based Asymptote Architecture’s Hani Rashid and Lise Anne Couture, coinciding with the inaugural Formula 1 Etihad Airways Abu Dhabi Grand Prix on November 1 marks Abu Dhabi as a cultural destination for the 21st Century. New York, October 29 – Asymptote Architecture proudly announces the opening of the Yas Hotel in Abu Dhabi. The Yas Hotel as envisioned by Asymptote, is the world’s first building designed to span a Grand Prix race circuit and will open it’s doors to coincide with the inaugural 2009 Formula 1 Ethiad Airways Abu Dhabi Grand Prix on November 1st. 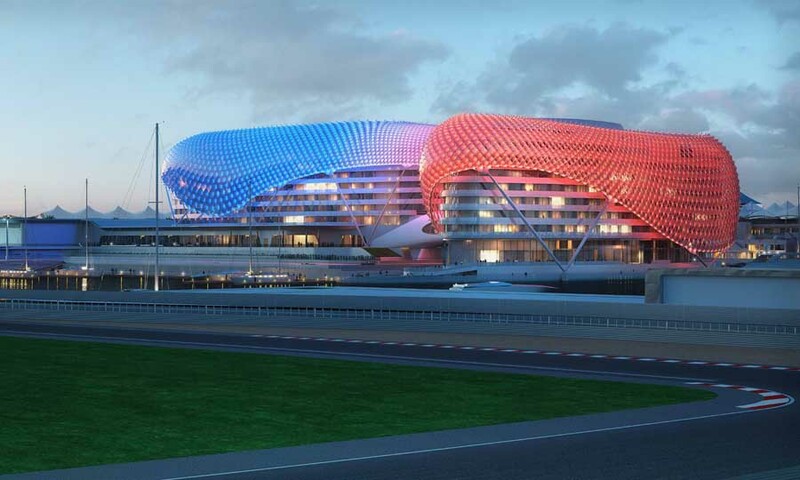 The Formula 1 event will be the largest sporting event ever held in the UAE and the Yas Hotel is designed to be it’s centerpiece and icon, helping transform Abu Dhabi into the new important and exciting cultural destination in the region. Aldar Properties PJSC awarded Asymptote the commission to design the 85,000-square-meter complex from a closed competition two years ago. Asymptote founders and principals Hani Rashid and Lise Anne Couture have created an architectural landmark embodying inspirations ranging from the aesthetics and forms associated with speed, movement and spectacle to the artistry and geometries forming the basis of ancient Islamic art and craft traditions. 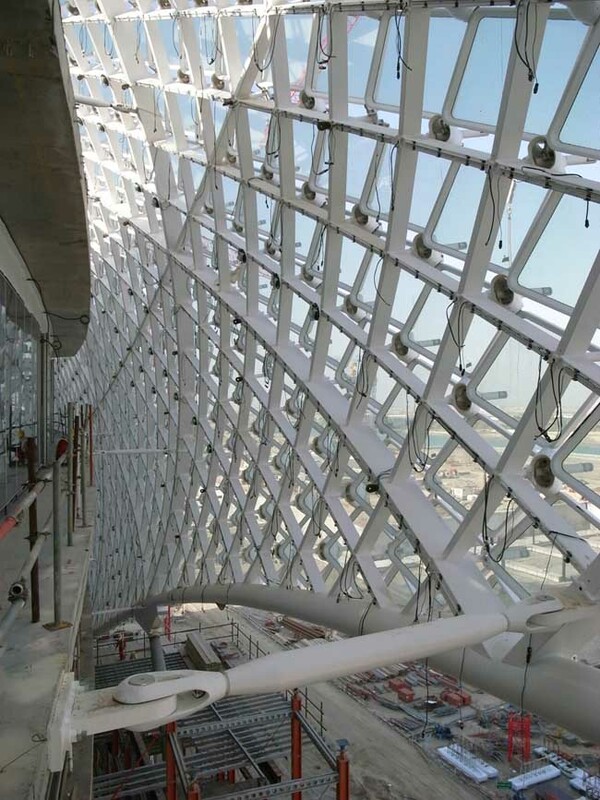 The Yas Hotel’s Grid-Shell component, a 217-meter expanse of sweeping, curvilinear forms constructed of steel and 5,800 pivoting diamond-shaped glass panels, affords the building an architecture comprised of an atmospheric-like veil that contains two hotel towers and a link bridge constructed as a monocoque sculpted steel object passing above the Formula 1 track that makes its way through the building complex. The Grid-Shell visually connects and fuses the entire complex together while producing optical effects and spectral reflections that play against the surrounding sky, sea and desert landscape. The architecture as a whole “performs” as both an environmentally responsive solution as well as an architecture of spectacle and event. 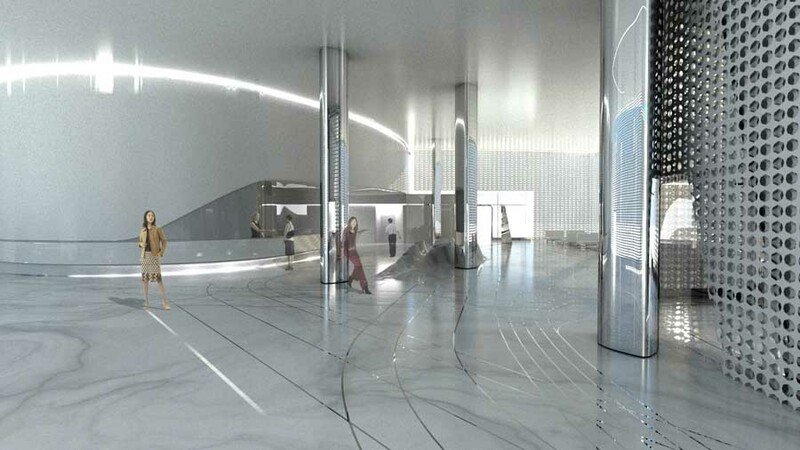 The entire jewel-like composition of the project responds visually and tectonically to its environment to create a distinct and powerful sense of place as well as a breathtaking backdrop to the Formula 1 and other events that the building will celebrate. Hani Rashid describes the buildings design and it’s architecture as: “A perfect union and harmonious interplay between elegance and spectacle. The search for us was to achieve an inspired architectural response to what one might call the ‘art and poetics’ of speed, specifically as it relates to Formula 1 and motor racing. That notion coupled with the making of a building that celebrates Abu Dhabi itself as a cultural and technological tour de force. Hani Rashid and Lise Anne Couture are New York based award winning architectural practitioners of international acclaim. 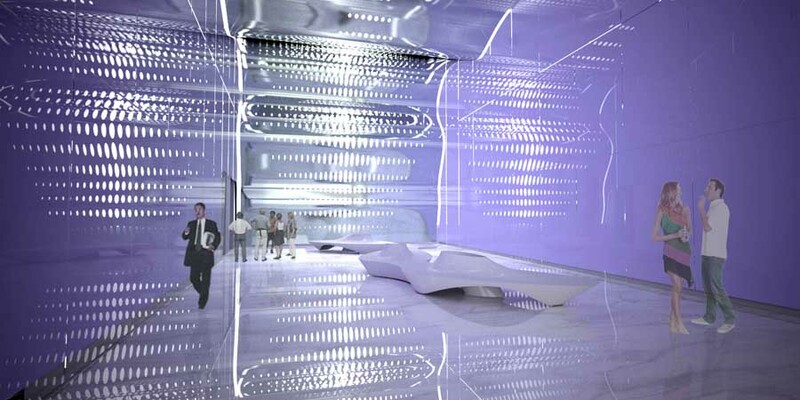 Since Asymptote’s founding in 1989, the firm has been at the forefront of innovation and technological advances in the fields of architecture and design and garnered praise for visionary building designs, master plans, innovative interiors and art installations, virtual reality environments and object design. The Yas Hotel, operated by Aldar Hotels & Hospitality, offers 500 luxuriously appointed guest rooms, international cuisine in 8 restaurants and pioneering design and architecture. The Yas Hotel will host several illustrious events in its first year, ranging from fashion to sports on a global scale. 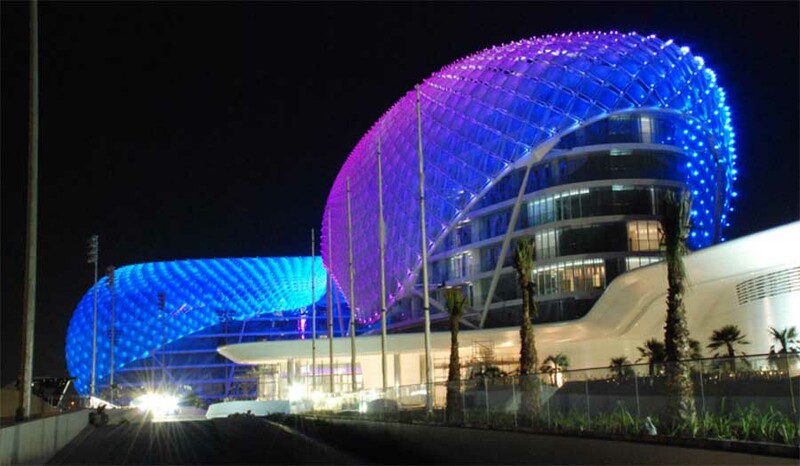 Located on Yas Island, The Yas Hotel is 10 minutes drive from Abu Dhabi airport, 15 minutes from Abu Dhabi’s National Exhibition Centre and 50 minutes from Dubai Marina. 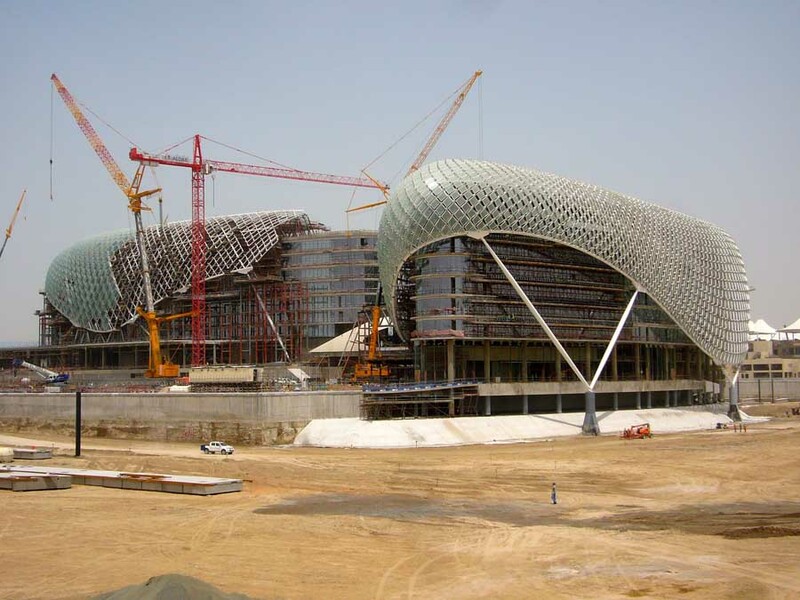 May 2009 – Asymptote Architecture, the award-winning, New York-based practice, nears completion of The Yas Hotel project in Abu Dhabi, UAE. 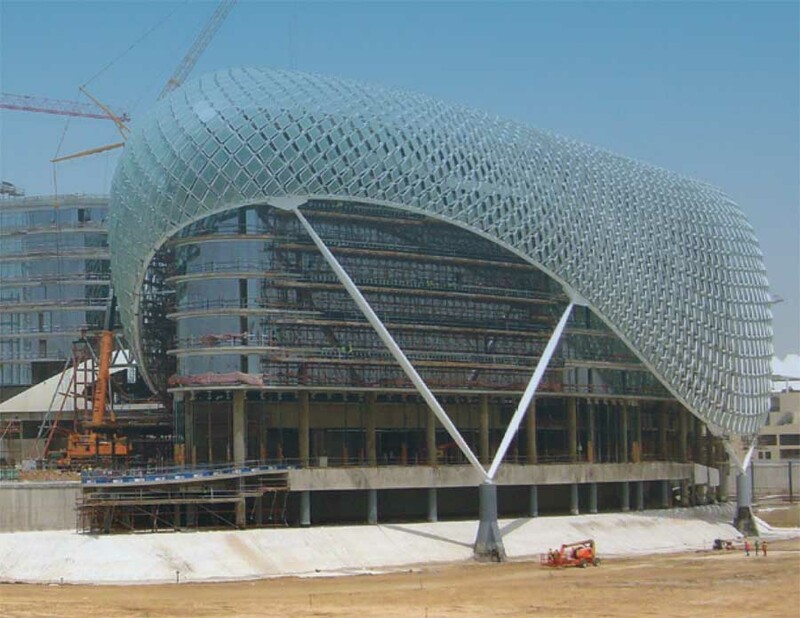 The Yas Hotel is a 500-room, 85,000-square-meter complex now under construction by Aldar Properties PJSC. Asymptote was awarded the commission to design the buildings and environs from a closed competition two years ago targeting an opening date of October 30, 2009 to coincide with the Formula 1 Etihad Airways Abu Dhabi Grand Prix. 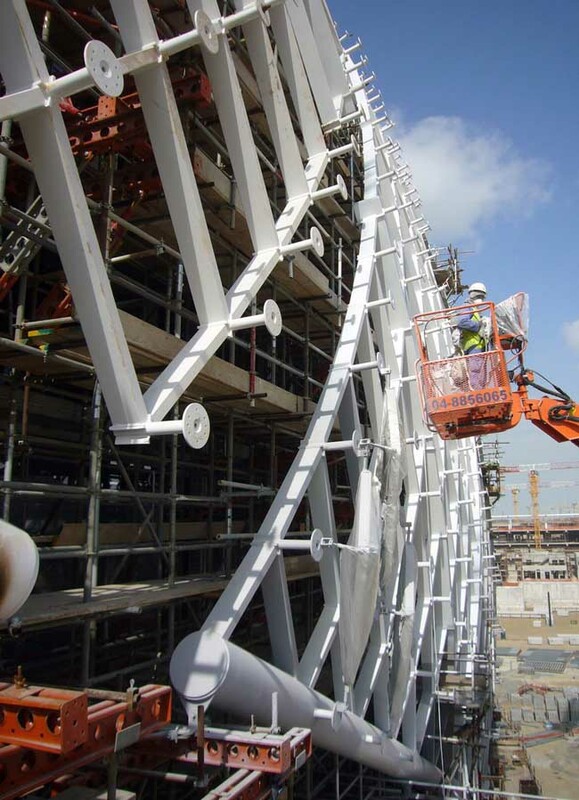 The Yas Hotel is one of the main architectural features of the ambitious 36-billion-dollar Yas Marina development and accompanying Formula 1 raceway circuit, also near completion. Asymptote’s founders and partners Hani Rashid and Lise Anne Couture envisioned an architectural landmark embodying various key influences and inspirations ranging from the aesthetics and forms associated with speed, movement and spectacle to the artistry and geometries forming the basis of ancient Islamic art and craft traditions. 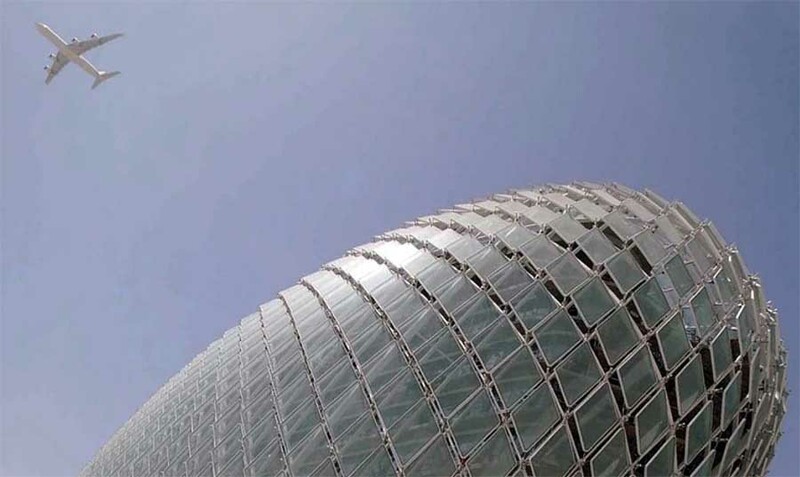 Of architectural and engineering significance is the main feature of the project’s design, a 217-meter expanse of sweeping, curvilinear forms constructed of steel and 5,800 pivoting diamond-shaped glass panels. 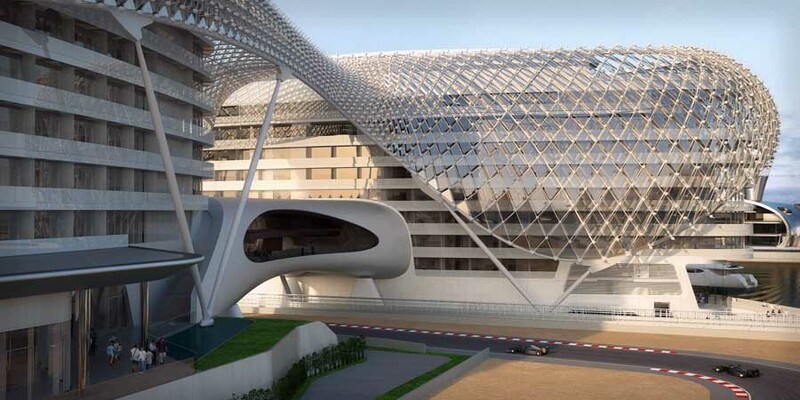 This Grid-Shell component affords the building an architecture comprised of an atmospheric-like veil that contains two hotel towers and a link bridge constructed as a monocoque sculpted steel object passing above the Formula 1 track that makes its way through the building complex. The Grid-Shell visually connects and fuses the entire complex together while producing optical effects and spectral reflections that play against the surrounding sky, sea and desert landscape. The architecture as a whole “performs” as both an environmentally responsive solution as well as an architecture of spectacle and event. The entire jewel-like composition of the project responds visually and tectonically to its environment to create a distinct and powerful sense of place as well as a breathtaking backdrop to the Formula 1 and other events that the building will celebrate. 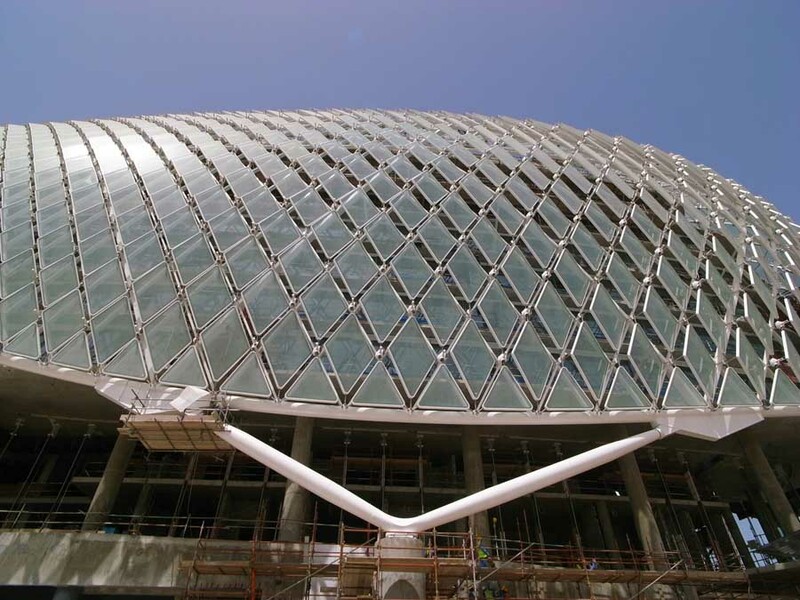 The Yas Hotel is designed to be a significant landmark destination on Yas Island for Abu Dhabi and the UAE at large.